We are a multi-disciplinary group of researchers, committed to understanding children and young people as experts of their own lives. This project has been instigated in response to an idea put forward by a group of young people, involved in UCan (the young researchers group working with The Centre for Children’s and young People’s Participation at The University of Central Lancashire). They wanted to create opportunities to utilise participatory research as a means to share other children’s and young people’s stories of resilience and transformation within the wider community. This project aims to harness the power of the interactivity and connectivity of sharing children’s and young people’s stories of resilience. 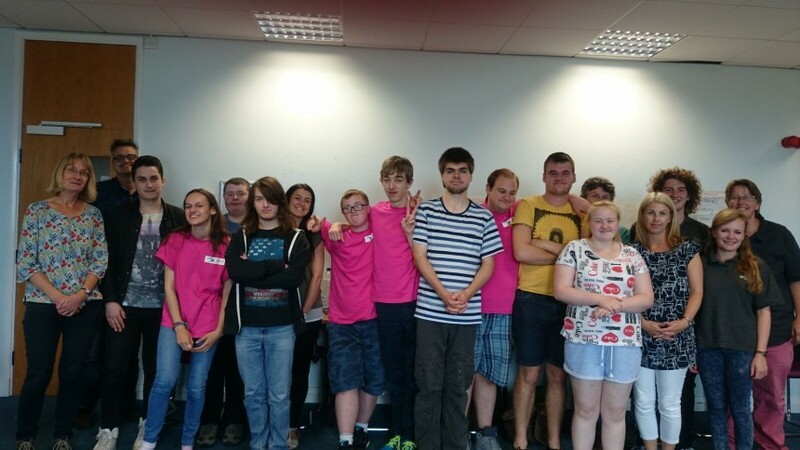 The project was instigated to respond to aims set by a group of young people associated with Barnardo’s ‘Include me 2’ project, who wished to create further opportunities for participatory research and storytelling, building on work they had previously carried out with UCLan. Using their definition of community as ‘a group of people who work together to help each other out’, children in care and disabled young people involved with ‘Include me 2’ participation work reached out to other children and young people who used Barnardo’s services in Lancashire such as ‘Early Family Intervention’, ‘Targeted Youth Support’, ‘Young Carers’, ‘Edge of Care’ and ‘Short Breaks for Young People with Disabilities’. Such families’ particular circumstances mean that they often occupied a marginal place in and at the edge of wider society, and it is this ‘edge’ that we intended to dissolve. Young researchers were trained to conduct interviews and collect stories from other children and young people using these services. The young researchers worked with well-known children’s authors including Melvin Burgess and Adele Geras to refine their stories; they then co-designed bespoke Internet of Things (IoT) ‘phygital’ (physical-digital) artefacts with the project designers; and they used these unique interconnected phygital objects to re-tell the stories to a wider community of children, parents and other stakeholders. The aim of using phygital objects was to re-present these stories in a very tangible manner and provide a greater range of dissemination and interaction modalities, thereby helping the children and young people to fulfil their desire to ‘work together to help each other out’ and improve both the lives of and links between members of their community, especially those on the edge of care. Recognizing children and young people as experts on their own lives, the research was supported by Barnardo’s in partnership with academic researchers in Literacy/Education (Dr Candice Satchwell), Design (Dr Paul Coulton), Social Work (Dr Cath Larkins), Literature for Children and Young People (Dr Helen Day), and Health (Prof Bernie Carter) from the University of Central Lancashire and Lancaster University. The multidisciplinary nature of our project means that we worked within cross-cutting research contexts. Crucially this project was about negotiating boundaries, which were conceived in various ways. Our team incorporated Imagination Lancaster, who acknowledged that: “Creativity and innovation occur at the boundaries and the convergence of science, technology, social science, humanities and the arts.” The phygital outputs were the means by which children and young people and Barnardo’s worked together to permeate the boundaries separating different parts of the same geographical community. This was achieved through the power of narrative, engaging with multiple literacies (oral, written, digital and phygital), and cutting-edge design technology. 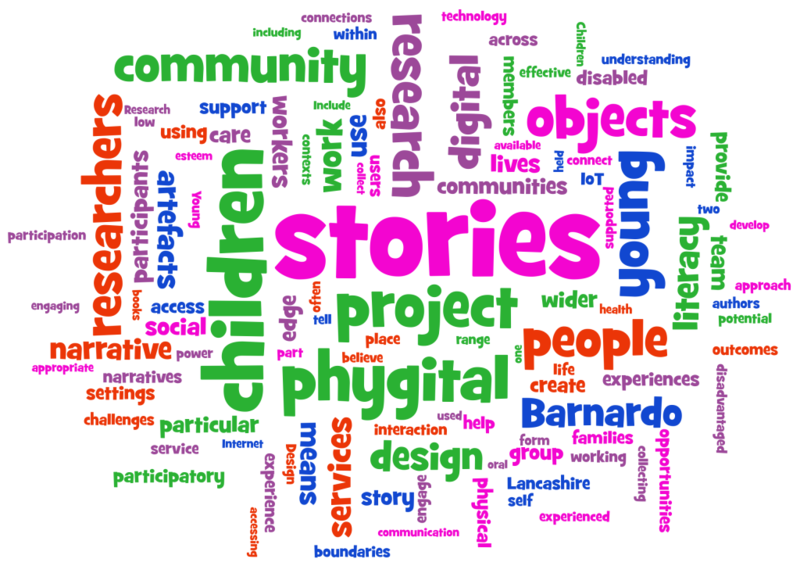 Barnardo’s in Lancashire served a community of high disadvantage and, at the start of the project, had a contract to deliver participation work with disabled children and children in care across Lancashire. Families with children who had accessed multiple services were under particular scrutiny through the government’s ‘troubled family’ agenda, which appeared to stigmatise them for poor parenting, not taking responsibility for themselves and their children or failing to engage with services. Alternatively, some ‘troubled families’ fell through the net of service provision or were passed from one service to another. Our project advocated a democratic partnership approach, in which service workers and users shared responsibility for identifying issues of concern and possible solutions and where children, young people and their families are supported to gain knowledge, skills, information, self-esteem and efficacy in accessing and navigating services. Our research promoted the abilities of children, young people and families to breach the ‘edge’, by promoting the formation of networks, knowledge and confidence to achieve stability and safety. The project began from the premise that narrative is an effective means of communication, and can convey information to people who may not access or accept a leaflet or more formal means of communication. Narrative approaches in social work are seen as offering potential to enable service users to negotiate critical moments in their lives and to engage with communities and vulnerable groups around issues of social justice and inequality and to empower young people leaving care. However, whilst there is evidence of the transformative power of stories, further inquiry was needed into ‘the particular methods of narrative practice, such as DST [digital story-telling]’. In line with Freire’s literacy work and his ‘face-saving’ pedagogy, we acknowledged the importance of choosing a form of communication that kept participants safe and promoted their ability to engage and share. Building on the notion that people connect with stories, we were particularly interested in children and young people co-developing stories that were accessible through digital media and artefacts, both for children and their parents or carers. Our use of phygital means of story-telling pushed the boundaries of both literature and literacy, both of which were fields of study for our team, with particular interests in boundaries between contexts of family, school, and community. The 21st century has seen a shift from print literacy to digital literacy, but there were indications that physical connection with stories still resonates with children and young people. For example, stories shared on an iPad are seen as ‘intimate and happy’ experiences partly due to the shared physical experience of the artefact between adult and child. Similarly, children in primary schools still enjoy ‘big books’ held by the teacher with opportunities for children to point at and touch the page. Whilst there has been research collecting the digital stories of disabled adults, these remained located on the internet accessible only via computer screens. The development of phygital objects built on recognising the importance of artefacts by combining the physical with the digital, with an object creating a portal to a digital world. By allowing children and young people to design their own phygital objects we investigated the complexities of meeting user demands in the effective design of such artefacts. Our subsequent evaluation of these artefacts provided some insights into the use and effects of narratives accessed via complex multimodal contexts. Despite low socioeconomic circumstances and low levels of literacy, children’s households predominantly had access to computers, mobile phones, and tablets. Indeed, people who were considered to have low literacy levels were often competent users of digital technology and engage in a wide variety of informal literacy practices in their everyday lives. Our project provided children and young people with the opportunity to engage with digital/phygital story-telling and -listening, which we believe improved engagement and self-esteem and provided opportunities for practising oral literacy through interaction with the objects. However, the project also impacted favourably on literacy through additional opportunities to read and write in both traditional and multimodal digital ways. Although we focused on the oral telling of children’s stories, the stories were transcribed and re-written with the help of renowned authors. Printed versions of the stories are also available as resources which can be used in settings such as schools, thereby encouraging children to read and to write their own stories with an impact on literacy. Low levels of literacy are associated with disadvantaged communities, and also with ill health, and households in such communities are unlikely to have collections of children’s stories in the form of books. Personalised stories have been found to be more engaging for young children and there will be opportunities for both the participants and subsequent users of the stories to develop personalised narratives using both the printed and interactive digital products of the research. The outcomes of the research are of particular interest to researchers in digital, phygital and print literacy; researchers in narrative both as a form of enquiry and as an intervention; those interested in improving access to and outcomes for ‘hard-to-reach’ communities; those working on the affordances of phygital objects; and producers of children’s literature wished to explore alternative means of accessing new readers, or ‘participants in narrative experiences’. Klett-Davies, Martina 2012. A critical analysis of family and relationships policies in England and Wales (1997-2011).Families, Relationships and Societies, 1(1) pp. 121–131. Hayden, C. and Jenkins, C. 2013, Children taken into care and custody and the ‘troubled families’ agenda in England. Child & Family Social Work doi: 10.1111/cfs.12095. Roose, R., Roets, G., Van Houte, S., Vandenhole, W. and Reynaert, D. 2013, From parental engagement to the engagement of social work services: discussing reductionist and democratic forms of partnership with families. Child & Family Social Work, 18: 449–457. Coste, D. 1989, Narrative as communication [electronic resource] / Didier Coste; foreword by Wlad Godzich, University of Minnesota Press; Dauite, C. & Lightfoot, C. 2004, Narrative Analysis. Studying the Development of Individuals in Society, Sage; Boje, D.M. 2002, “Narrative inquiry: Experience and story in qualitative research”, Human Relations, 55, 6, 734-740; Clandinin, D.J. & Huber, J. 2002, “Narrative inquiry: Toward understanding life’s artistry”, Curriculum Inquiry, 32, 2,161-169; Carter 2004; Frank 2010. Hinyard, L.J. & Kreuter, M.W. 2007, Using Narrative Communication as a Tool for Health Behavior Change: A Conceptual, Theoretical, and Empirical Overview, Health Education & Behavior, 34, 5, 777-792; Wahler, R., Singh, J. & Singh, N. 2009, Parents’ Autobiographical Narratives: Setting Events for Their Contemplation of Mindful Changes, Journal of Child & Family Studies,18, 5, 520-529. Lenette, C., Cox, L. and Brough, M. 2013. Digital Storytelling as a Social Work Tool: Learning from Ethnographic Research with Women from Refugee Backgrounds, British Journal of Social Work doi: 10.1093/bjsw/bct184; White,M. 2003 Narrative practice and community assignments, International Journal of Narrative Therapy and Community Work, 2, 20–55. Martin, F. E. (1998) Tales of Transition: Self-narrative and Direct Scribing in Exploring Care-leaving, Child and Family Social Work 3(1): 1–12. Lenette et al 2013, p.4. Freire, P. 1974 Pedagogy of the Oppressed (M. B. Ramos, Trans.) New York: Seabury Press. Kucirkova, N., Messer, D., Sheehy, K. & Flewitt, R. 2013, Sharing personalised stories on iPads: a close look at one parent-child interaction, Literacy, 47,3 115-122. Ivanic, R., Edwards, R., Barton, D., Satchwell, C., Fowler, Z., Mannion, G., Miller, K., Smith, J., Martin-Jones, M., Hughes, B. 2009, Improving Learning in College, London: Taylor & Francis; Satchwell, C., Barton, D., Hamilton, M. 2013, ‘Crossing boundaries: digital and non-digital literacy practices in formal and informal contexts in further and higher education’ in Goodfellow, R. and Lea, M. (eds) Literacy in the Digital University. London: Routledge (SRHE); Ivanič, R., Satchwell, C., Edwards, R., and Smith, J. 2007 ‘Possibilities for pedagogy in Further Education: Harnessing the abundance of literacy.’ British Educational Research Journal, 33, 5, 703-721. Westerveld, M.F. & Gillon, G.T. 2010, “Oral narrative context effects on poor readers’ spoken language performance: Story retelling, story generation, and personal narratives”, International Journal of Speech-Language Pathology, 12, 2,132-141. Arora, A., Mcnab, M.A., Lewis, M.W., Hilton, G., Blinkhorn, A.S. & Schwarz, E. 2012, ‘I can’t relate it to teeth’: A qualitative approach to evaluate oral health education materials for preschool children in New South Wales, Australia, International Journal of Paediatric Dentistry, 22, 4, 302-30.